The teeth of Tyrannosaurus rex were specialized to help the animal eat anything it wanted to. There were tiny serrations to help them cut through flesh, and the tooth itself was round in cross section, for breaking through bone. The crown of the tooth was covered with hard enamel. The long dentine roots were dissolved and reused by new teeth as they grew. Eventually, the old tooth, worn from use and weakened at the root, would break off while feeding (causing a shed tooth). This would make room for the new 'germ tooth' to grow into position. Unlike mammals, dinosaurs grew new teeth throughout their lifetime. Many of STAN's teeth were found loose in the rock around the bones. Because each tooth "socket" produces a different shaped tooth, it was possible to put those teeth back into the appropriate sockets of 58 available positions. Wear surfaces on the teeth show that the lower jaws closed inside the uppers, like giant shears, enabling T. rex to bite through even the leg bone of another T. rex! STAN's right dentary highlights the tooth replacement process particularly well, with several germ teeth moving into position within existing teeth! 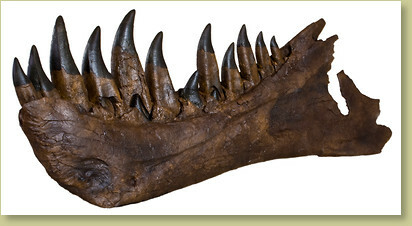 There are indications of a healed injury on the back of the dentary, possibly a result of a battle with another T. rex. Display this magnificent piece by itself or with comparative dentaries from other species. Can be purchased alone or on an oak base, with brass I.D. tag. Credit The original STAN T. rex skeleton is on exhibit in The Museum at Black Hills Institute, in Hill City, South Dakota. Notes May take approximately 8 weeks for production. Check with us to see if an earlier delivery is possible.